Start training early for the 9th annual Fremont Oktoberfest 5K presented by Pyramid Breweries and taking place Sunday, September 25th at 10:00am. The official 5K takes runners from the Solstice Plaza (near N. 34th Street and Fremont Ave North) along the scenic Burke Gilman Trail and Ship Canal and ending at the Fremont Oktoberfest Pyramid Breweries Village Beer Garden. Regardless of experience, these lighthearted training tips will prepare you for the ultimate beer run. Register early. Registration is now open! Pre-registration for the race is $25 and includes a Fremont Oktoberfest 5K t-shirt. Day-of registration is $35, but t-shirts are not guaranteed. Sign up for a special running division. -Beer Belly Division: Got a beer belly? No problem! Beer Belly Division participants will be treated like Oktoberfest royalty. Entrants that jump on the scale and qualify for the prestigious position – men who are +220 pounds and women who are +175 pounds – form this coveted crew. Besides earning the respect and admiration of fellow racers, division members will be honored with the unfair advantage of starting first, and thus ensuring the possibility of getting to the beer finish line before the rest of the pack! -Team Division: Running and drinking are more fun with friends! Dress in dirndl, lederhosen or costume of choice and take your buddies to the streets in the four-person team division. The winning team will be determined by average race times. Train often. 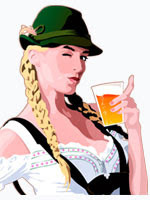 Want to practice for the Fremont Oktoberfest 5K? Try running a few 5Ks to get your racing feet wet. You could even get the chance to run alongside the Fremont Oktoberfest 5K Runners in the Firecracker 5000, Kent Cornucopia Days 5K or Covey Run. Stay motivated. Setting realistic goals is an easy way for any runner to stay motivated to complete a race. At the Fremont Oktoberfest 5K, reaching the Pyramid Breweries Village Beer Garden at the finish line is a popular goal set by many racers. Runners looking for more libations later in the day can visit the Oktoberfest Tasting Garden, which opens at 11:00am. Advance tickets for the tasting garden is $20 and day-of entry is $25. For more information or to register to run, visit FremontOktoberfest.com/run. You can also keep up with the Fremont Oktoberfest 5K runners on Twitter - @FOKT5K.